A few years ago, I was about to take my second academic sabbatical at NEHGS. My first sabbatical produced much of the research needed for the Vital Records of Stoughton, Massachusetts, to the end of the year 1850, published by the Massachusetts Society of Mayflower Descendants in 2008. 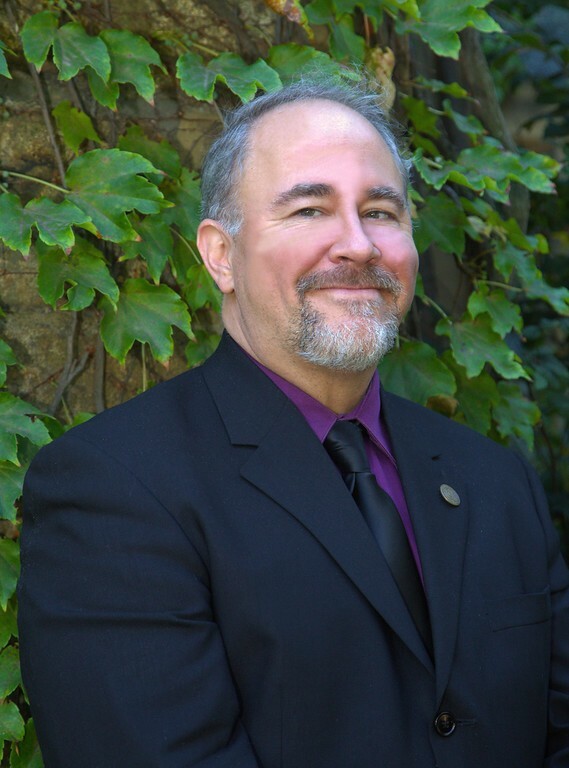 For my second sabbatical I wanted to select a project that would benefit genealogists and historians alike. I had a conversation with our President D. Brenton Simons, and he made me aware of a little-known manuscript of Boston records at the Rare Book Department of the Boston Public Library. These fragile books contain the “Taking Books” (later renamed Valuation Books) for the town of Boston from the early 1780s through 1822. Sadly, the Boston “Taking Books” compiled before 1780 were destroyed by fire, according to the finding aid at the Rare Book Department. The remainder of the “Taking Books” – from 1823 to 1940 – are located at the Boston City Archives in West Roxbury, Massachusetts. I assessed that the vast number of books available in the Rare Book Department collection could not be transcribed during the time of my three-month sabbatical. I decided that the most relevant set of books from this series would be those for the year 1800. The taking books give an actual appraisal of Boston residents and the taxes and polls they were assessed. There was once an 1800 Federal Census for the town of Boston (incorporated as the City of Boston on 4 March 1822). By the dawn of the twentieth century, no sign of this 1800 census for Boston survived. This census volume or collection of pages may have been lost in a fire, or accidentally discarded during the nineteenth century. Besides Boston, much of its parent county (Suffolk) is also missing. The taking books give an actual appraisal of Boston residents and the taxes and polls they were assessed. These books are arranged by ward and street, and then by order of the actual house by house visitation. On occasion additional information can include occupation or employment status; mental or physical disability; whether currently “at Sea”; whether the occupant removed to another location; and, sometimes, race or ethnicity. These books detail the valuation for individuals from all walks of life. Individuals range from Paul Revere the goldsmith to sailors who are renting one room while in port. For the database I digitized these pages and transcribed the names of the head of household; the ward; and the description of the specific dwelling. These images are searchable now on American Ancestors. You can also browse the images from the 1800 Taking Book for Boston page by page as well. If you are researching an ancestor from Boston, this small window on the dawn of nineteenth-century Boston may be of interest. I sincerely hope this work serves as a valuable census substitute for Boston for 1800. (You may also wish to consider consulting the 1798 Direct Tax for Massachusetts. The latter is also available on American Ancestors.) The Boston City Directory in many cases does not list everyone that the taking records listed. If you wish to consult a copy of the published 1800 Boston city directory you can do so online at the Boston Athenaeum. Bravo! Cannot wait to carver out some time to browse! While the FULL value would be databasing the entire collection (and given its fragility, why not? Mass Cultural grant or Nat. Edownment for Hum. for funding? ), a step-by-step approach would be to do the earliest 5 years, including 1780, then do 1795, then go on with a census year + the mid year until you get to 1940 (1810 +1815, etc.). The other years can be filled in as time & $ allow. For both genealogists AND historians (the latter being my primary professional identifcation), that would provide usuable data aggregations for broader soci-economic analyses. Note: Harvard didn’t pay for data entry, or at least not fully, on that project. I would suggest a cooperative arrangment with that project with NEHGS creating the inputable data and having linked db access a la FamilySearch. Just following up on Brenton’s stated cooperative approach here. And an EVEN MOREIMPORTANT REASON to continue would be to skip to the years 1889-1890-1891, because, of course, the 1890 Census also does not exist–as we know, given it doesn’t exist for ANY town, city or state!!! Just call it The Boston 1890 Project, get grants and co-funding, and make yourself the managing director. Why not, eh? 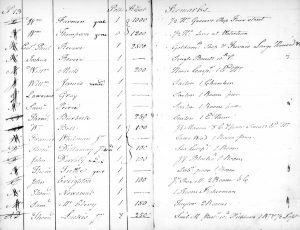 Myself, I have a line on a late 17th century “census”, unknown and never used but well archived, with often more than head of household information for a wide swath of towns, which will be easier to publish than Hobbs’ and still fit perfectly into the 1771 db format. Just need grants. And, of course, CONGRATS on what you have able to achieve on just a 3-moonth sabbatical. Robert, thank you so much for the Harvard link. 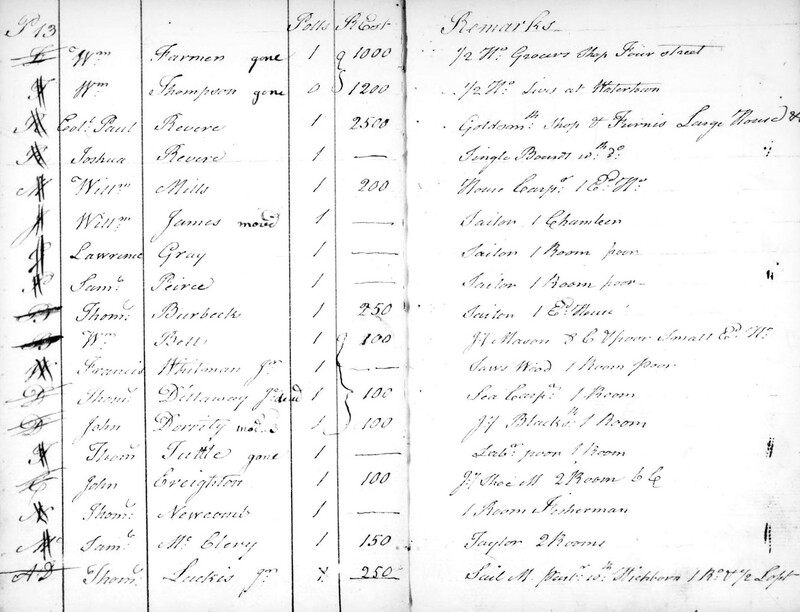 I just found tax records for 10 ancestors in no time flat. Fantastic! Yippee! At least one of my ancestors should be in this resource, so I look forward to seeing what details I can find. Thanks so much for your sabbatical work and for letting us know about its fruits. The BPL Rare Books and Mss. dept that holds these taking books through 1822 is still closed for renovations and recataloguing, and no date for reopening has been released publicly. The Boston City Archives is open throughout to look at volumes from 1823 and after, and I have found the staff there very helpful. The tax books are in 3 series, the “Taking” or “Valuation” books are the most useful for genealogists. All volumes in all 3 series are viewable online at FamilySearch.org. In the “Taking Books, individuals are are not indexed by name of owner or resident. Depending on the year and how detailed the actual tax takers were for particular wards, you may find different abbreviations used: “Jyman”- Journeyman; “App”= Apprentices; “A” in the “Polls” column = “Alien”, i.e. a non-citizen. This can be a very useful way to identify relatively recent immigrants as non-native. In the columns for “Owner” and “To whom taxed,” a letter abbreviation like “A” will refer to first letter of the next preceding proper name. It takes quite a bit of review and experience to figure out the appraisal columns as owner or taxpayer, for both personal and real estate. It is not always clear whether a tenant is being taxed for his own personal possessions, or whether his appraisal is part of an aggregate value for all residents in that tenure or property–systems of notation vary from ward to ward and year to year. You may also find valuable information in the “comments” column at far right — “Co[partners] with Hagerty” identifies business partners; or, “gone” means the former resident has moved out by the time of the assessment; or, “saucy” applied a young woman means the assessor had a roving eye. All kinds of random information may be found in this column. Listings may sometimes say for example, “John Tolliver, cab’maker, journeyman to Vose,” allowing you to identify whom he worked for. Over several years, I reviewed Ward 12 “Taking Books” for every furniture craftsman from 1790 through 1835 and extracted all the information. This provided a long-term picture of the tremendous growth of the ward, changes in employment of journeyman craftsmen. I know of no other source so rich for the intimate study of Boston neighborhoods in this period.